Personality: Extremely secretive about himself in particular. A thieving delinquent who loves to mess with people and flirt with them just the same! Very curious and a bit greedy especially when it comes to cash, he won't hesitate to rat someone out if given the short end of the stick. He comes off as childish and arrogant but is actually quite clever and does what he wants. He is constantly reaching for his goals, whatever they might be, people have yet to figure him out! On rare occasions, one can reach and see his heavily guarded sensitive and loving side. When upset or embarrassed, Jack usually pulls his bandana over his mouth and breaks all eye contact. Weapon: A loaded crossbow that is also his lute that he plays for musical pieces, but it can only hold so many bolts. 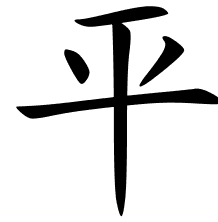 Very few would be able to tell that it is also a weapon without closer examination. Jack has a light splash of freckles spraying across his cheeks and the bridge of his nose and shoulders. He stands roughly at 5'8" with a full curly/wavy wad of crimson hair that stops halfway down his neck and curls lightly into his face. His eyes are a bright honey-gold and sparkle like the morning sun on the horizon. His body appearance is that of the athletic type and has considerable leg strength for jumping or kicking while his upper strength is decently made for minor parkour such as swinging from bar to bar. Underneath his shirt and hidden, he has a thin medium, diagonal scar going down his chest. Jack usually wears his favorite goldenrod shirt that stops just a tad below his waist while his sleeves stop a few inches before hitting his wrists. The collar rim is black. 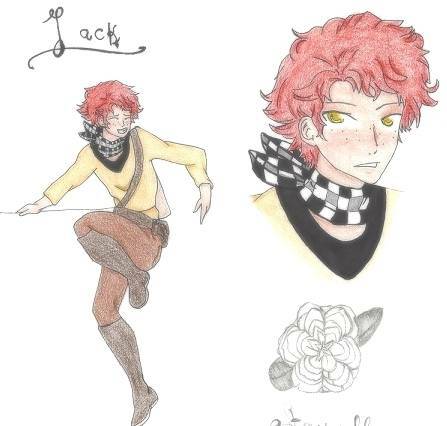 Jack wears a checkered bandana of white, gray and black with every outfit around his neck and tends to hide specific items securely there (his most treasured item -a stone silver flower- is hidden there). His pants are dark chocolate brown with little back/front pockets and a pair of dark brown knee-high boots cover his feet. Around his waist is a firm belt that can be adjusted to his needs that holds a pouch of lock picks, money, various acquired items, and his lute from time to time (but his lute is usually strapped around his body-over one shoulder and around the waist- and resting on his back). Abandoned in the Amora Mountains at the age of 7, Jack had grieved heavily enough to be found by a strange group of people. They took him into their small 'family' and trained him with another kid his age. Their methods were harsh yet effective. As the years went by, Jack began to wonder whether his parents truly abandoned him, or if they were murdered... He never questioned it out loud. By the age of 11, he started to see the bad side of the organization. They brought in people with darker and darker intentions that wanted to take any and everything, even lives. Jack was against the idea, but was overruled, and eventually, his opinions meant little. At the age of 16 while on a theft run, Jack accidentally ran into a girl. At first they were very distant to one another before several more encounters eventually led to a relationship. His relationship sparked many bad things within his group of thieves, and they told him to cut it off as a way to protect themselves. Jack refused. He proposed to her in the mountains at the age of 20, never to hear her answer, as a blade had stuck itself deep into her heart. Heartbroken, confused, frightened, and unable to truly bring himself to harm the people he once called family, he tried to flee from them. Members couldn't just leave whenever they wanted. He managed to escape the small organization with several bruises and a blow that was nearly fatal. Ever since he has been more secretive and less inclined to be near others for long periods at a time in fear of getting hurt again or captured for his past mistakes. Despite this, he is often playful around others and vocal, but that doesn't stop him from trying to rile them up either as Jack will compliment a person only to degrade them in the same sentence! His favorite pastime is singing and making beautiful melodies in quiet areas where few lurk, but his job consists of random tasks by villagers and occasionally stealing from them as well.